The Taliban already control large chunks of Helmand but the fall of Sangin underlines the security challenge facing the Afghan government and its Western allies. Sangin’s capture shows the Taliban’s growing strength in the south and it has symbolic significance for the US and Nato, which lost more soldiers there than in any other district in Afghanistan. Since security responsibility was handed from Nato-led troops to Afghan forces in 2013, hundreds of Afghan security forces have lost their lives defending the district. There are now two possibilities. Afghan troops, with the help of US special forces and aerial bombing, might try to recapture Sangin, following a pattern seen elsewhere. Or the government will leave the city to the Taliban – as they have done with a few other districts in Helmand, a centre of the insurgency – and focus on defending the provincial capital, Lashkar Gah. Taliban spokesman Qari Yousuf Ahmadi said the insurgents had captured Sangin and “key outposts” overnight. Taliban forces had already surrounded the district headquarters. A spokesman for the Afghan defence ministry said troops had been pulled back to their main garrison on the orders of the army chief of staff. 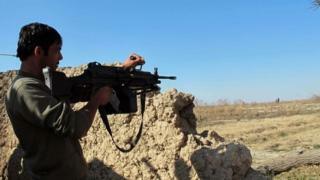 Reports say foreign forces have begun bombarding the area, which has been fiercely fought over for more than a decade. On the road to the crucial Kajaki dam, Sangin was the scene of heavy British and US military casualties before Nato combat forces left Afghanistan in 2014.